Samantha graduated from the Welsh Institute of Chiropractic in 2003 and immediately planned to study animal chiropractic, but was unable to start her postgraduate studies for a few years. 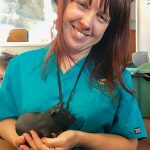 She eventually travelled to Options for Animals in Kansas to start her animal chiropractic journey and became IVCA certified in 2010. She has studied animal chiropractic extensively in Kansas completing all the advanced modules on offer. Sam runs a busy and successful practice in Suffolk caring for animals large and small alongside her regular human clinic.